The other day my neighbor stopped by and asked, “if there is one thing that you learned or that Marma showed you in her life what is it?” And there was a pause as the many thoughts of so many things that Marma had revealed in her life flooded by. However the one that came to the forefront of the mind was Fearlessness. That Marma revealed Fearlessness by the way she lived. Here is a bird called a “Chicken” and in this world that word is usually heard as something that is a coward. Yet after spending a year of life with a bird that has been labeled a “chicken” I can tell you that she was one of the most brave characters I have ever met. To be something in this world that everything wants to kill and to be aware of that, she was quite aware that things wanted to kill her not some things but just about all things and yet she lived fully. She had been attacked by dogs and lifted off the ground and dropped by a hawk and yet she still went back out. She would let the same dog that attacked her, come near her again, she didn’t hold anything against life. If a hawk came she didn’t stand there like a tough guy, she would go find shelter but not out of cowardness, out of consciousness. When danger passed she would come right back out. Nothing that ever came up prevented her from going on the walks, she didn’t hide away from life, she got right back in it. Some one might say that getting attacked and going back to where you have been attacked and just living your life, would be stupidity, but from Marma it was revealed as Fearlessness, she was willing in a sense, to die to live. She was acutely aware of her surroundings, but it did not stop her from enjoying her life. She would bury into the ground and ruffle her feathers and get dirt so deeply immersed in her that I would have to make her fly out of my arms about 5 times before all the dirt would be out of her. She could have gone in the pen with all the other chickens to keep herself protected but each morning I would put her by the gate and she would decide whether she went in or she didn’t and if she didn’t … she would spend her day alone on the lawn munching and avoiding the things that wanted to kill her. She showed me how to live fearlessly, not carelessly but fearlessly. To be aware of ones surrounding and conscious that death is always near, and yet do what you enjoy, to do the things that you enjoy in spite of the fact that death is looming. This may not relay through the way it was experienced because unless you spend your time with a chicken or any animal fully, you do not get to grok the gifts they reveal in their life. She was an animal that was gifted wings and yet could not fly … pretty much was a defenseless creature but super intelligent. Maybe when we are denied certain defenses, we are given gifts in different ways because she could sense danger from mile or more away. In fact, the day she died she was acting strange and jumped from my arms and ran to the neighbors backyard. My life is completely changed by hers and hers by mine. She gave me the view of a life of Fearlessness and I gave her the space to fully be what she was. The chicken is said to represent fertility (the whole "chicken and egg" argument notwithstanding). The chicken is symbolic of pride: the first creature to greet the sun, the first to announce thier presence to the world (which, in light of the age-old argument, may be the East's solution to the question: the chicken announced itself, and then bothered to procreate). However, they also have a secondary symbolism. Chickens are agents of enlightenments in their adulation of dawn. Throughout mythology and folklore, it is always the chicken who represents the break of day; they are the auditory signal that wakes the sleepers, that arrests the intrusion of darkness. How many myths hinge upon the hero being rescued by the sudden arrival of daybreak? How often are the nocturnal monsters sent scurrying into the shadows of the West by the sound of a rooster's cry? 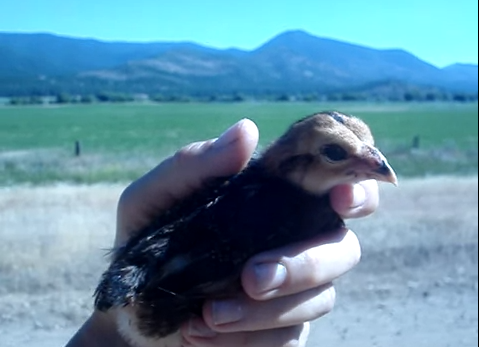 The chicken is a transitional creature, one poised on the liminal threshold of change. They must be aware in darkness, for they wake in that time and place and know to look for the light; they are the early worshippers of the enduring cycle of life. To become a chicken is to ascend the wheel of karma, as it is a more purified creature. When a chicken's head is cut off, its body refuses to recognize death. It fights decay, fights dissolution, fights off the darkness. But, like all flesh, it cannot sustain itself forever. The chicken, in the end, is a symbol of the futility of hope. In the end—of every day, of every life—night comes.